Starwood Capital Group made a big bet on the U.S. retail market in November 2013. Barry Sternlicht’s private equity firm bought a 90 percent stake in seven malls from Westfield Group for $1.6 billion through an affiliated company. Located in towns like Toledo, Ohio, and Olympia, Washington, the malls were filled with national brands and boasted an average occupancy rate of 96 percent — the kind of properties considered a very safe bet at the time. But the retail market was rapidly changing as e-commerce continued to push hundreds of brick-and-mortar stores out of business, and Class B malls in midsized cities increasingly found themselves in hot water. At the malls Starwood had bought from Westfield, net operating income fell more than 8 percent over the next four years, regulatory filings show. Then in 2018, a $760 million securitized loan backed by five of the seven malls came due. Starwood had to find a new source of financing or risk losing the properties, so it decided to sell bonds in Israel. To get a cheap interest rate, though, it needed to convince investors that the malls were lucrative and the risk of default was minuscule. The company tapped appraisal firm NPV Advisors to assess the value of the properties, and NPV conveniently found that the seven malls had barely seen a loss over the past five years. Their combined value of $1.74 billion — down from $1.78 billion in 2014 — implied they were low-risk investments, per the appraiser. So Starwood sold $244 million in bonds to more than 60 investors on the Tel Aviv Stock Exchange last March. But many would soon regret their decision. The malls’ combined income fell by another 4.8 percent between the third quarters of 2017 and 2018. And by mid-December, the price of the bonds had fallen by 42 percent, the Wall Street Journal reported. Representatives for Starwood and NPV declined to comment. “Israelis were suckered into investing in those projects without understanding how they work,” a bank executive in Israel, who has helped other property owners raise money in Tel Aviv, said on condition of anonymity. And Starwood isn’t the only company that has been able to raise debt thanks, in part, to a favorable appraisal. Kushner Companies’ retail condo at 229 West 43rd Street had an initial appraisal of $470 million. Just five months later, however, S&P valued it at $230 million — less than the amount of its loan. And the Trump Organization’s office building at 40 Wall Street was appraised by Cushman & Wakefield at a value of $540 million in 2015, but was later pegged at just $260 million by S&P. An analysis of large commercial mortgage-backed securities deals by The Real Deal found that ratings agencies routinely shave more than 20 percent off bank appraisals in the lead-up to bond offerings. In more notable cases, the shaves are 40 to 50 percent. Part of the difference is that ratings agencies look at the worst possible outcomes over the course of a 10-year loan when they give a valuation, said Moody’s CMBS analyst Kevin Fagan. And, according to a recent Moody’s report, the larger the discrepancy between appraiser values and ratings agency values, the more likely the chance of default. Compared to residential assessments, the commercial appraisal process is far more complicated and subjective, industry sources said. Both 40 Wall Street and 229 West 43rd Street were bundled with dozens of other properties in their respective securities offerings, which mitigated the risk on each building. That points to a broader issue: Appraisals, meant to reflect a property’s value as accurately as possible, are often divorced from market reality. The issue of questionable commercial appraisal practices surfaced in a recent New York Times investigation of the Trumps’ real estate empire, looking at the use of several schemes to reduce tax liability across the family’s New York portfolio. Among the most successful were the lowball appraisals they received from Robert Von Ancken, who valued more than two dozen large multifamily buildings at just $94 million — including some buildings he said were worth less than zero. A decade later, the Trumps sold off the properties for more than $700 million. The manipulation of building values is widespread and ongoing, sources said. In some cases, the victims of unbalanced appraisals are investors who buy bonds based on inflated valuations. In other cases, the general public takes a hit, losing out on tax revenue when property owners contort tax assessments with the help of appraisers. The root of the problem, according to several insiders, is a conflict of interest. Appraisers are supposed to be impartial. But they are hired and compensated by people who aren’t, which makes them vulnerable to pressure. Virtually everyone in the real estate business insists that most commercial appraisers do their jobs diligently, and don’t fudge numbers just because someone tells them to. But many acknowledge that resisting clients’ demands to come up with the right numbers is a daily struggle. While subprime residential mortgages were the main culprit in the last financial crisis, flawed appraisals in the commercial debt market also played a role. Appraisers, working for banks and building owners, began devising numbers based on projected values rather than actual figures like cash flow and debt service. A $225 million CMBS loan on Stellar Management’s rent-stabilized Riverton apartment complex in Harlem went into default in 2009, for example, because its value had been estimated based on ambitious plans to raise the rents. In that case, lenders and ratings agencies were willing to see the business plan as viable. And at Stuyvesant Town–Peter Cooper Village, a 2009 court decision meant the deregulation of hundreds of apartments would no longer be legal, leading Fitch Ratings to downgrade three CMBS deals backed by the buildings. Steve Williams, an executive at the real estate data company Real Capital Analytics and former appraiser, recalled assessing a property for a lender in 2006, at a time when speculative appraisals were becoming the norm. “I can remember getting on the phone and saying, ‘OK, this property is worth $200 million,’ and he said, ‘Oh no, we’ve already committed $250 million as our share of the consortium,’” Williams recounted. After a brief back-and-forth, he concluded that he wouldn’t be able to come up with an appraisal to justify the lender’s commitment. 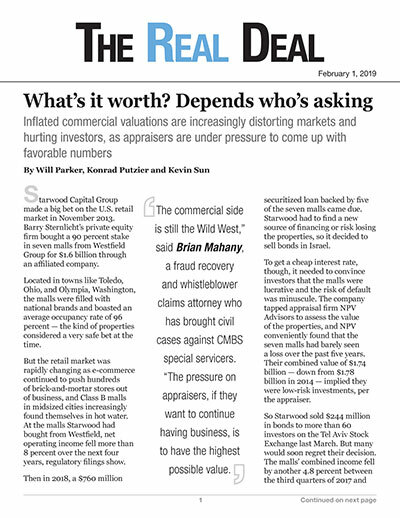 In other cases, appraisers have allegedly been tapped to help deflate securitized mortgage values. Numerous lawsuits have been filed over the years alleging that senior bondholders and special servicers, who control CMBS loans, conspired to devalue the underlying assets so the bondholders could buy the debt at fire-sale prices. One of the more notable examples involved an $85 million loan on the Bryant Hotel in New York, which was part of a CMBS offering that defaulted during the downturn. The senior bondholder, Mission Peak Capital, was able to buy the debt at a discount in 2014 after the loan’s special servicer landed an appraisal of just $75 million from Cushman & Wakefield, according to a 2016 lawsuit. Investors were enraged, and one decided to sue Mission Peak in 2016, losing on appeal last year. CMBS trusts now operate under terms less favorable to senior debt holders, according to multiple people familiar with the matter. But investors have struggled to get the courts or regulators to recognize appraisal problems in older CMBS deals, Mahany said. And state courts have previously ruled that borrowers and building owners do not have standing to bring fraud claims against a loan’s special servicer and senior bondholders — only the other bondholders do. One New York attorney, who has worked on CMBS litigation, speculated that there have not been more lawsuits like the Mission Peak case because small-time bond investors are typically afraid to get involved in major commercial litigation. Following the crisis, Congress made substantial reforms to the appraisal rules for residential properties, as well as securities backed by them. Mortgage lenders were required to keep their appraisers at arm’s length, and the appraisal process became more data-intensive. The changes also included more federal oversight of appraisal problems. But reforms centered on the commercial appraisal process were far less robust. In theory, banks are supposed to ensure that their loan officers aren’t involved in choosing a property’s appraiser, to prevent them from trying to influence the assessment. And sources say the firewall between the lending and underwriting departments at most banks has grown stronger since the financial crisis. In many cases, however, appraisers don’t need to be directly influenced to know what’s expected of them. Jonathan Miller, who runs the New York residential appraisal firm Miller Samuel, said pressure on appraisers has become more “indirect” since the crisis. Mortgage lenders usually commission appraisals on buildings that they intend to finance through a bidding process. Appraisers can win the job by offering lower fees, or by demonstrating a track record of coming up with numbers that satisfy their clients. When appraisers feel pressured by banks, they can contact the Treasury Department’s Office of the Comptroller of the Currency, which handles appraisal complaints. But in practice, few ever do, since complaining about a bank to its regulator likely means losing a client, according to several people in the business. Another theoretical safeguard is that appraisers whose valuations have no basis in reality can lose their license. But that also rarely happens. A TRD review of New York Department of State records found that while residential license revocation or penalties were not uncommon, no commercial appraisal professionals have lost their licenses since 2014. The problem, many say, is that appraisal is a highly subjective form of analysis. Most people in the business try to predict a property’s future income and the return that investors will be willing to accept years from now. Even small changes in these figures can lead to a huge difference in valuation, and two appraisers can come up with completely different numbers for the same property — even if they both technically follow the rulebook. That offers a lot of leeway for appraisers to work in their client’s favor. Ed Lombardo, a commercial real estate loan officer at Quontic Bank and a former appraiser, said property owners often ask appraisers to come up with low numbers to keep their tax bill down. But sometimes it’s the other way around. Marty Levine, a commercial appraiser at the New York firm Metropolitan Valuation Services, said appraisers are being pushed to do their jobs faster than ever, which leads to less thorough work across the industry. Unlike in banking, there is little stopping landlords from influencing appraisers hired for tax assessments. One appraiser, who has worked with the Trump Organization and spoke on condition of anonymity, said the company is known for being particularly forceful in its attempts to influence appraisals. Levine said the Trumps and other New York landlords own properties that can be difficult to appraise because many use outside management companies, which means a lot of a building’s revenue ends up in other accounts. “You take the money out of the property, you have less real estate income and more business income,” he noted. Colliers’ Murrett said pressure from property owners is so common that his firm often insists on upfront payment regardless of how the appraisal turns out. “The art of a good appraiser is telling your client something they don’t want to hear” and still getting compensated, he said. But he and a handful of other commercial appraisers insisted that fraud cases are the exception, and that most professionals do the best they can to come up with an accurate valuation.